In the world of wine, it seems most people stick to the same grape varieties day in, day out. This means there are dozens/hundreds/thousands of delicious, but perhaps a little bit obscure, wines that are simply ignored by the masses. So, on that basis, wow many white grape varietals can you name right now? Go on…give it a try. How many did you get? Three? Five? After sauvignon blanc, chardonnay, pino grigio, riesling and semillon, what else can you name? Did you get chenin blanc? Roussanne? Marsanne or viognier? Maybe even melon de bourgogne (used to make Muscadet) or gewurztraminer? This may seem like a lot of grapes to remember, yet they are just a few drops in a sea of wines to discover. There are so many well-made, fruity and fresh white wines out there made with lesser-known grape varieties, but they are unfortunately overshadowed by the marketing machines behind sauvignon blanc and chardonnay. Italy alone has dozens of excellent white wines that few people outside the country could pronounce – let alone commit to memory – yet the average person still defers to the same international grape varieties over and over again. This leads us to albarino, which is grown primarily in Spain and Portugal, two countries probably better known for their red wine production. This is a shame because both countries produce some beautiful whites; I need only point to white Rioja as an example of another great wine that all too often goes unnoticed. Perhaps the reason for white Rioja’s low profile is its minute production compared to its crimson cousin, but perhaps also because it is often an acquired taste among white wine drinkers who prefer zingy acidity and freshness to white Rioja’s nutty, slightly oxidised flavours. 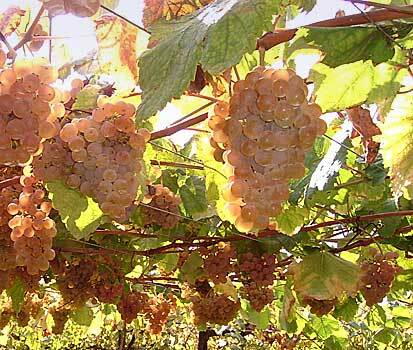 Albarino in Spain most often comes from the Rías Baixas region in the northwest. Until recently it was used in blended wines but these days it has emerged as a varietal in its own right, producing wines fresh wines that come with ripe fruit flavours. As with many white wines, albarino makes a good match for seafood, poultry or creamy pasta dishes depending on its style. Two albarinos to try are Orballo Albarino Rias Baixas 2010 (£9.99, Virgin Wines) and Val do Salnes Albarino 2010 (£11.99, Marks and Spencer). Orballo’s albarino has wonderful lemon and peach aromas mixed in with a hint of sea breeze and minerality, followed by a nice layer to acidity, that make it a fine accompaniment to seafood. It also goes nicely with creamy chicken pasta dishes. For slightly less than £10 a bottle, this is affordable enough to have during the week or even on the patio for a Sunday afternoon lunch. Meanwhile, the Val do Salnes albarino comes in a little more expensive than the Orballo but offers up intense fruity flavours of peach and apricot with a good zing of acidity to follow. This is a little more off-dry than the Orballo version but is not at all sweet. It will go nicely with rich seafood dishes, such as those cooked with butter or other flavourful sauces, but it will also match nicely with scallops and squid. ← If science says wine stops colds, why am I sick?